Mayor Zimmer is right not to be happy, and to be suspicious of PATH's stated motives. Decreasing the frequency from six minutes to seven does indeed decrease the line's throughput and capacity -- by almost 15%, in fact, assuming all else remains the same (same consists, etc.) Given the fact that the trains are already congested, this move will only further increase congestion within New York's largely transit-dependent commute market. In other words, this move will not increase capacity. In fact, it will only make the capacity problem worse. The rank hypocrisy in the press release is appalling. There are good reasons for reducing the frequency. The rolling stock might need to be rebuilt; this reduces the trains on hand and so requires frequency reduction. Perhaps the tunnel needs some work. (Though that can be done off-peak.) But to judge whether the plan has merit, PATH needs to be transparent. And in lying, it proves it is not. With JFK Plaza (aka LOVE Park)'s redesign plans being released -- to Inga Saffron's acclaim -- the city is now reinvesting in two of the three large parks surrounding City Hall. Each of the parcels is different: Dilworth Park was created to provide a large plaza abutting City Hall itself (it destroyed the Arcade Building and part of the Broad Street Station headhouse to do so) and was recently transformed from the underwhelming, sunken, dreary, depressing Dilworth Plaza into Dilworth Park, a gracious front entrance to City Hall facing West Market; LOVE Park is set atop a sunken parking garage at the base of the Parkway and is currently a semi-successful granite-stepped mess; and lastly there was Reyburn Plaza. The oldest of them all, Reyburn was built to replace Penn Square when City Hall was finished. Once home to the Municipal Bandshell, Reyburn was built between North Penn Square (now JFK Boulevard) and Arch, Broad and 15th, and later extended west to 16th. It's hard to ascertain how successful a public space it was in the prewar era, but it was quadrisected by streets: a cutoff of Broad Street the subway ran under, the foot of the Parkway, 15th Street. 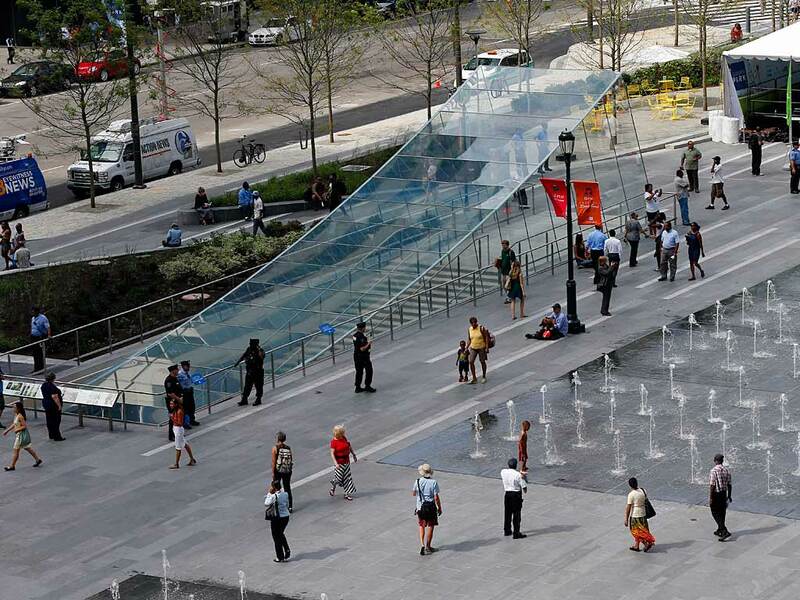 It had probably failed by some point or another as the space was split into the modern-day LOVE Park and the Municipal Services Building (whose hardscape plaza is still officially called Reyburn) by the 1960s. In any event, Reyburn is definitely the black sheep of City Hall's park collection. The Planning Commission is very much aware of this. Indeed, in the Central District Plan, the Commission recommended several small-scale fixes for the plaza. As This Old City noted some time ago, these proposals amount to a small-scale fix filling the plaza's edge with pavilions instead of large granite retaining walls. These pavilions would have rooftop plaza space, providing a unique park feature as well. But the real problem is that Reyburn Plaza is a failed park. Even as the area around City Hall has redeveloped, Reyburn also has the fewest residences around it -- both today and potentially: it is almost ringed by public structures. And -- competing with two viewshed-protecting parks (one heavily funded and programmed) -- it has few, if any, advantages to set itself apart. The biggest issue Reyburn faces, though, is the underground infrastructure. The Broad Street Line subway was built under the cutoff; the Center City Commuter Connection (Regional Rail tunnel) runs under the southern edge of the site; the southwest corner is nicked by the Parkway's viewshed. None of these issues are insurmountable, especially with the use of creative engineering. And finally, there's the Municipal Services Building itself. Half a century old, the structure is aging, hard to navigate, and poorly laid out (despite the dramatic payment spaces in the basement). Mechanicals abut 15th, which makes opening the wall facing LOVE Park difficult; much of the office space lies in a dark, underlit basement. The structure needs a top-to-bottom overhaul, and the City could well consider rightsizing the space. Park space is only as valuable as how well it's used. Even on good days, Reyburn is an empty, windswept, trash-strewn cartoon of a plaza with its giant Sorry pieces scattered about. Its bleak desolation sets North Broad's fourth-fiddle tone, and there are few opportunities to capture value from the blocks abutting it, given the wealth of public and nonprofit development. The city owns some juicy development parcels of its own nearby (the Gallery's three unused tower bases, Blanche Levy Park at 16th and the Parkway, and the parking lots at 13th and Arch and 15th and Cherry) to put a new, better-designed MSB on -- if not an outright long-term lease. Sale of Reyburn Park's land would offer a cash stream for this. And it's not like this is the only park in the area: indeed, it's one of three in addition to sitting at the foot of the Parkway in its own right. The sketch above shows a proposed program of development. 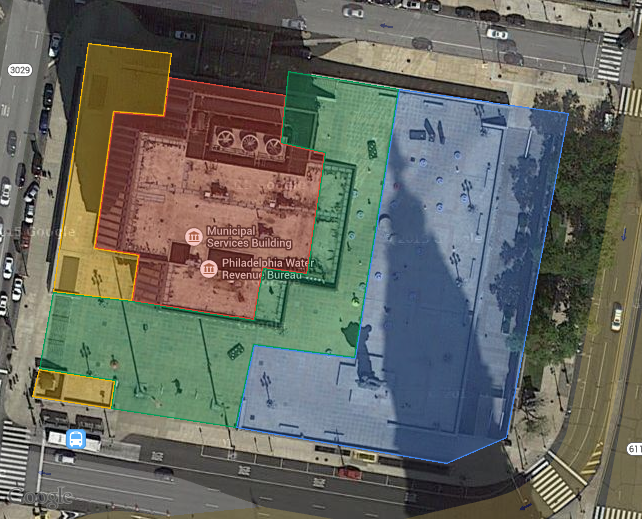 The MSB (in red) would be retained, but subject to a gut reno like Southwest DC's Sky House was. Once the EPA's offices, Sky House is today a large condo building. Kling's lobby and cashiering spaces would be maintained, but the building's mechanicals would be moved to where the basement office floor today lies; this frees up the Kling spaces, as well as the spaces facing 15th, for active ground-floor uses. Above that, on the deck, an al fresco dining area would be established overlooking LOVE Park. This could be treated like the cafe in the Comcast Center plaza -- or like the Independence Beer Garden at the base of the former Rohm & Haas building. A pavilion, bus shelter, and small headhouse would be established at the corner of 15th and JFK. 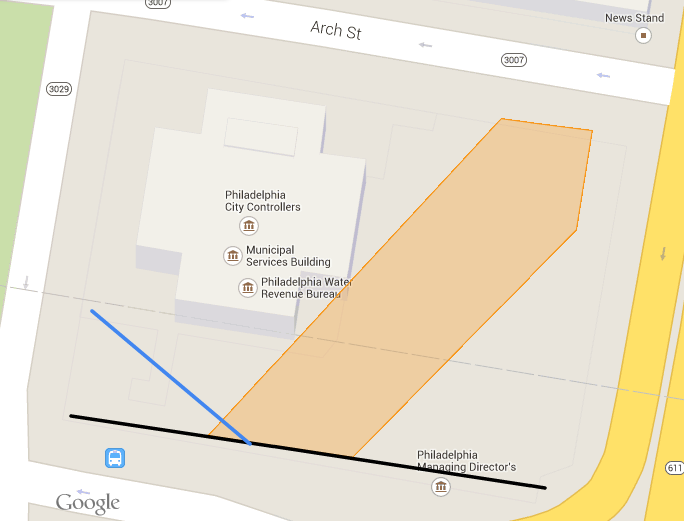 Ten North Broad would extend along the Broad Street side. A large mixed-use structure, Ten North Broad would share loading and mechanicals facilities with the new MSB; its main mass would lie along the Broad Street side, while its load would be diffused on either side of the subway tunnel. The elevator core would lie in its southeast corner. Finally, the plaza would be split into two smaller components: first, at the corner of 15th and JFK, it would preserve the Parkway viewshed; second, an interior plaza between the two buildings would provide an amenity space for the project's residential component. Reyburn Plaza is obsolete, outmoded, and underutilized. It's not a public amenity anymore. It's time to return it to private hands. MS Civil Engineering candidate at Temple. I also run my own consultancy, focusing on modeling parking supply and demand at the neighborhood level with a focus on policy. Did Newsom Create the Problem He Was Trying To Avoid? Did the Atlantic Ticket accomplish anything? What is Stopping Poor People From Moving? HrSR Pittsburgh to Harrisburg. Why? Better Routes? This isn’t an annexation. It’s a bailout. What should high-speed rail look like in Philadelphia County?